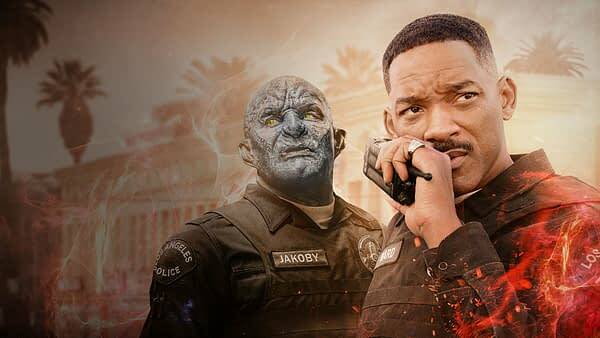 Cinema Sins is taking on the Netflix original film, Bright, that stars Will Smith, Joel Edgerton, Noomi Rapace and Jay Hernandez. The movie about two cops trying to work together in a world where Humans, Orcs and Elves struggle to co-exist. Daryl Ward (Smith) is the savvy street cop who gets Nick Jakoby (Edgerton) the first Orc police officer as his new partner. When I first saw the trailer, it felt a bit like Alien Nation which had human James Caan teamed with alien detective Mandy Patinkin. Here they’re uniformed officers that happen across a magical artifact, a wand, that is incredibly powerful and everyone wants. The two must put their own personal differences aside and work to protect the artifact from falling into the wrong hands. Which looks like it will put them up against other cops…. none of whom seem happy to have an Orc on the force in the first place. It’s trying to be more like Training Day than Harry Potter. The film is directed by David Ayer who also worked with Smith recently on Suicide Squad. It was written by Max Landis, also know for the recent Victor Frankenstein film and the BBC’s Dirk Gently’s Holistic Detective Agency series. The film got critically panned when it came out and Cinema Sins wasn’t the only one pointing out the flaws with it. Plus, there was charges of sexual harassment that came out against writer Landis, putting the film in a negative light. Netflix has chosen to do another, but Landis will have nothing to do with the production.